London: The new chapter of International Chamber of Media And Entertainment Industry for United Kingdom inaugurated here with great pomp and show on the visit of Dr. Sandeep Marwah Chancellor AAFT University of Media And Arts and President of ICMEI at London. A grand event was organized by ICMEI at newly opened and a prestigious club Bollywood Stories at London in the presence of who’s who connected to films, television, media, education and other glamour industries. 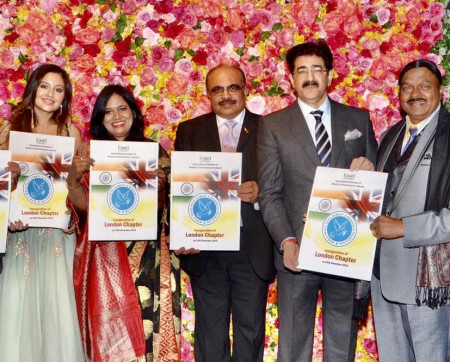 “We are overwhelmed by he response we have been getting all over the World for the activities, coordination and support ICMEI has been extended to the people of different industries, that has induced us to open another chapter at London,” said Dr. Sandeep Marwah. “London is considered as the leading global city exerting a considerable impact upon the arts, commerce, education, entertainment, fashion, finance, healthcare, media, professional services, research and development, tourism and transportation. ICMEI is thankful to you all for being with us here today,” added Dr. Marwah. Smita Srivastava of Confluence, Sunny Kulathakal Global President GOPIO-Global Organization of People of Indian Origin, A.C.Shanmugam former Member Parliament & Chancellor Dr. MGR Educational And Research Institute, Prabakaran Murugaiah CEO Techfetch, Anbarasan Ethirajan South Asia Regional Editor BBC News, Nitin Datta of Clive Christian Harrods and Gurpreet Bhangra MCA Executive Officer Maidenhead Conservative Association attended the event. Srishti Kaur Miss Teen Universe, Daljeet Kaur Senior Advocate, Dr. Vinod K Verma of Aditya Birla Group, Ritu Bhagat Social Worker, Jagruti Garment Exporter, Shalini V Bhargava Solicitor of SchfordsLaw, Deepak Yadav of Bollywood Stories, Ankur Sharma Director ITW Playwarx Media & Ent., Raj Kumar Baisoya of RKB Knots and Sandip Soparrkar Dance Director were also present there. Sandeep Marwah also nominated Mahendrasinh Jadeja as the chair for London Committee of ICMEI. Mahendrasinh Jadeja is a prominent member of the Indian community in Britain. He is a Business Consultant and an Ambassador for the Loomba Foundation. He is also part of the Executive of National Congress of Gujarati Organizations and President of Rajput Samaj of United Kingdom. Later Sandeep Marwah honored all the prominent members with the life membership of World Peace Development And Research Foundation, which was followed by gala evening and dinner.